Patch 1.2 for TOR adds an assortment of content and much-needed features like more dungeons and UI customization. 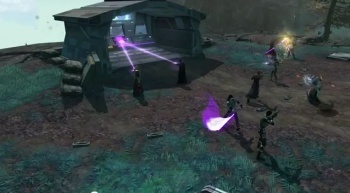 The team at BioWare behind The Old Republic aren't letting up. A successful launch of an MMO needs to keep the updates flowing to up the positive momentum. EA and BioWare's answer to that is the game update 1.2 - Legacy, which adds things like minipets and new dungeons while also enhancing the game's Legacy feature. For those of you who don't play TOR, you can link multiple characters on your account into a sort of family tree and the update coming in April will offer tons of perks and features for the Legacy system. Other highlights of the patch are features standard for other MMOs like guild banks and - finally - a way to customize your user interface. "Prior to release, our main priority for Star Wars: The Old Republic was to deliver a high quality game and service, right from day one," said Dr. Greg Zeschuk, one half of the founding team behind BioWare. "Now that we've achieved that, we have shifted our focus to adding more content to the game and improving and refining the experience for our fans. Legacy is our biggest update yet and a great example of the kind of content players can expect for the months and years ahead." Woah, is that a giant prototype to the AT-ST? And was that guy growing spikes? Yeah. There's a lot of stuff here. The first time I watched that video, I was looking forward to getting a mini Tauntaun. Then I remembered how bad those things smell. On the outside.